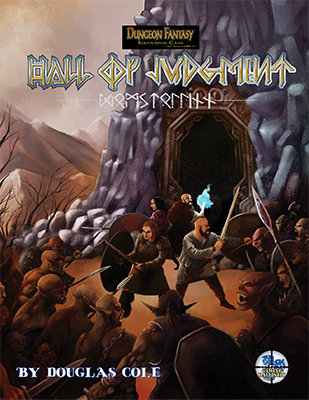 Daily Illuminator: Announcing Hall of Judgment for Dungeon Fantasy RPG! April 1, 2018: Announcing Hall of Judgment for Dungeon Fantasy RPG! The keys to the lost hall have been found . . . Deep in the glacial peaks northwest of Isfjall, past the northwest border of the realm, a band of adventurers is deceived and nearly destroyed by a powerful Alfar sorceress as they pursue raiding hobgoblins. Through bravery and sacrifice, they deny her possession of a lost holy relic. The Tiwstakn: key to finding the legendary Lost Hall of Judgment. Survive the journey. Vanquish your foes. Rediscover the lost hall. Claim your reward. The Hall of Judgment opens August 2018.